Scroll up or down to view all rows with info. 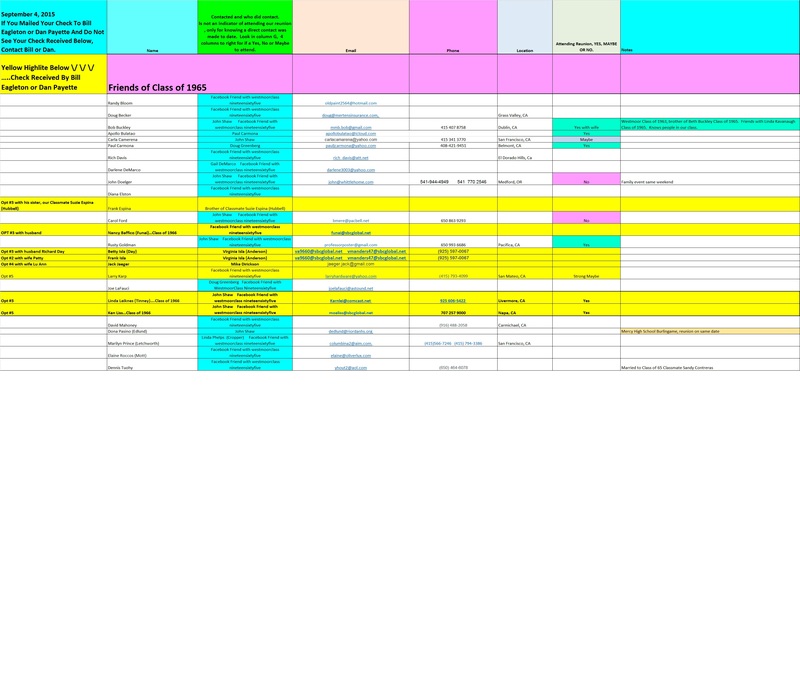 You may have to zoom in or zoom out to best view the spreadsheet document on your screen. There are Friends of Class of 1965 Classmates who want to attend our reunion and they / YOU are welcome, we will sell them / YOU a ticket. There is a community of Friends of Class of 1965. For example Westmoor Classmates from other years, usually 1963, 1964, 1966 & 1967 who were / are friends with Class of 1965 Classmates. People from other schools, for example Jefferson, Lick-Wilmerding, Mercy, Riorden, who are friends with Class of 1965 people..
We will absolutely not have a reunion like 2000 and 2005, where maybe 90% of Westmoor Classmates in the room at South San Francisco were from Classes of 1958 to 1964 and 1966 to 1969, and many attendees were strangers to all or most Class of 1965 Classmates..
Only someone who has a connect with Class of 1965 Classmates will want to attend our reunion. When you look at pictures, videos and participants for all previous Class of 1965 reunions, 1975, 1985 and 1990 structured only for Class of 1965, there are Friends of Class of 1965 in attendance. We are doing nothing different now.